Have just finished destroying my kitchen in the name of education. My students have complained that we don’t do enough hands on activities (we do as many as I can! they’re expensive! ), and since we are doing states of matter right now I thought I might as well show them Oobleck. 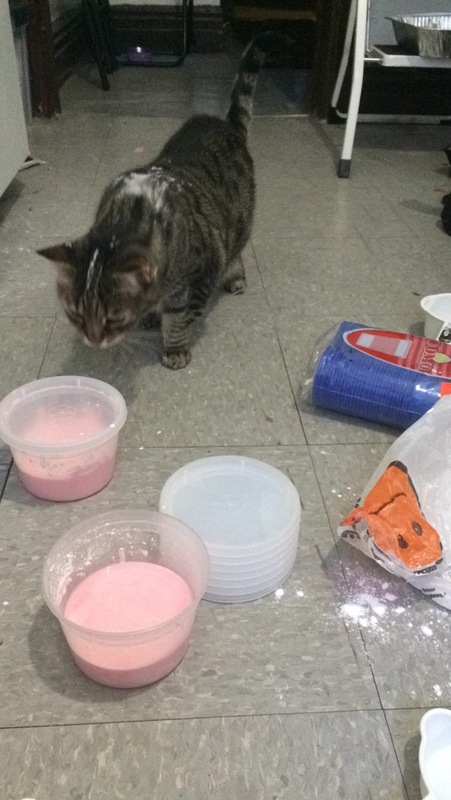 Oobleck is a non-Newtonian fluid, which means it does not obey the normal laws of Physics. It is cheaply made using cornstarch and water, but for having only two ingredients it is messy as hell. I was originally going to let my children make the Oobleck in the classroom. I was saved from this by a naptime vision of the bell ringing and my next class coming in to find mass anarchy and cornstarch everywhere. I decided to make the Oobleck myself. This decision has rendered my freshly purchased and non-returnable $30 dollars of measuring spoons and bowls effectively useless. 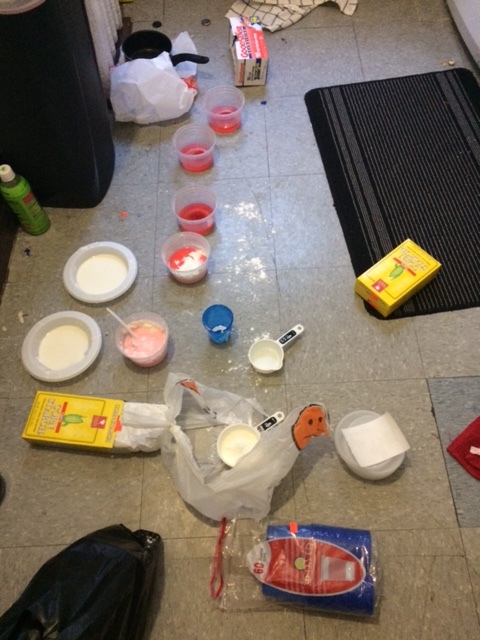 I originally was going to make one big bowl of Oobleck, but then realized that, being a non-Newtonian fluid, scooping it out to distribute it would be quite difficult. Therefore, I threw myself on the mercy of the Japanese women at my local sushi restaurant for takeout soup bowls. I spun them a sob story about the state of education in Brooklyn and wailed I would buy ten miso soups if I had to. They looked at me like I was insane and gave em to me for three bucks. A bargain. Then, The Cat sensed she was not the center of attention. She grew distressed. She emerged from her lair under Roomie’s bed and came to investigate. Deceptively cute even when covered in cornstarch. I think I closed most of the more disastrous loopholes, but I have no doubt they will find whatever loopholes are left. Have been cleaning up my kitchen and lost track of time. Have second date with Likes to Talk at 7:30. We are going to Chinatown for soup dumplings. 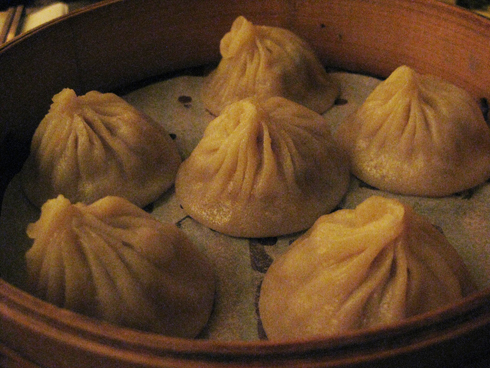 Everybody who knows me finds the idea of me eating soup dumplings hilarious. I am extraordinarily clumsy and awkward and have never eaten such a thing but have heard they are large and messy and exactly what they sound like. This picture comes from an article entitled “How to Eat a Soup Dumpling.” The fact that this article exists is not reassuring. It is basically a pocket of boiling water, what could go wrong? I really hope they aren’t spicy. I don’t do spicy. Having lost track of time, I am now in the unpleasant but common-for-me situation of having to choose between dirty straight hair or clean curly hair. My hair does not curl nicely naturally and without a curling iron. It forms a halo of frizz around my head unless I put on enough gel, and then it is crunchy. I am polling my friends and kicking myself for not having time for clean straight hair which is obviously the best option. Roomie said curly/clean but after I already got my head wet Sister finally texted back and said dirty/straight because boys don’t notice dirty hair. Emotional turmoil. Maybe the soup dumplings will distract him from my hair. Ahhh Oobleck. Hope the kids had fun with it! I’ve had to make it many times before too. Not gonna lie, I made it a couple years ago just because I was bored and it is fun to play with. Hope the date went well! So sorry, somehow missed your comment till now! It’s definitely super fun to play with. It went pretty well with the kids too, they were very respectful of the classroom and cleaned up really nicely! A lot of them had never seen it before. Blew their little minds.